Sometimes, if you want the best solution, you have to think outside the box. In fact, sometimes it’s best if you throw the whole concept of a box away. 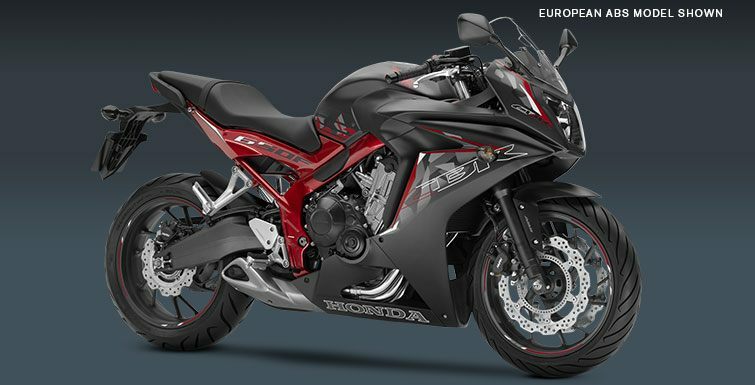 That’s what our engineers did with the CBR650F. Traditional displacement classes went 600-750-1000. But who says you had to stick to that? An extra 50 cc is going to make the CBR650F a lot more fun for a lot more riders. It lets us fatten up the powerband, but still keep the bike light and nimble. 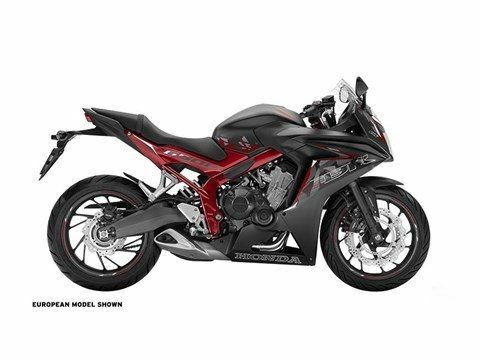 A fun ride at a great price, the CBR650F’s inline-four engine is specifically tuned for low-to-midrange torque, delivering a powerband that’s suited for a wide range of riding styles. Weekday commuter, weekend sport riding, long trips, short hauls, solo or with a passenger—the CBR650F does it all. So who cares for labels and pigeonholes anyway? Not the CBR650F. A great bike knows no limits. Especially not an extra 50 cc. CLIP-ON HANDLEBARS: Clip-on bars are an integral part of supersport bikes and for the CBR650F, they put you in a riding position that’s both sporty and comfortable enough for longer trips. 4.5-GALLON FUEL TANK: You asked; we listened. 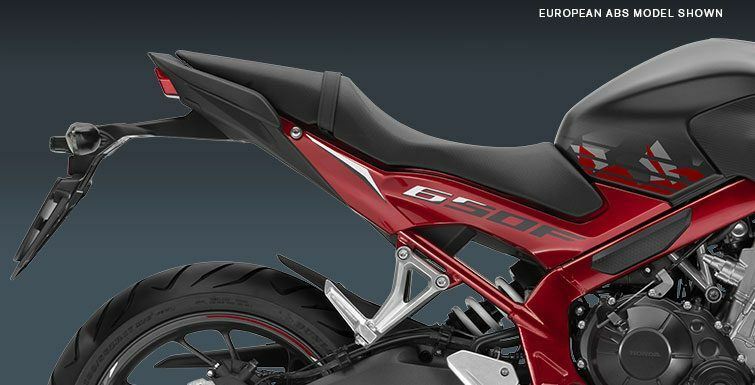 A bike as versatile as the CBR650F needs plenty of range, and the 4.5-gallon fuel tank provides just that. TWIN-SPAR STEEL FRAME: A steel frame is strong, but not too rigid for the needs of the everyday rider. With a 57-inch wheelbase, the CBR650F is also quick and responsive—just what a machine in this class should be. 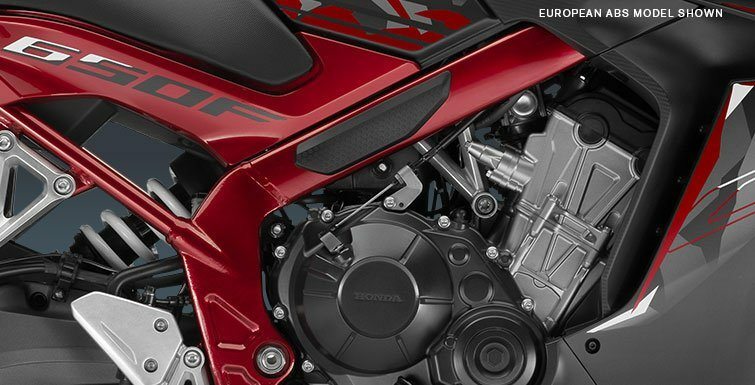 FOUR-INTO-ONE EXHAUST: Power, style and an unmistakable growl—you get all three with the four-into-two-into-one exhaust system on the CBR650F. 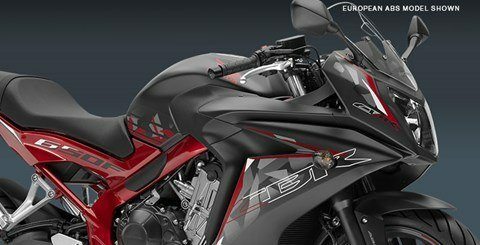 SUPERSPORT-STYLE FRONT COWL: The CBR650F may be a terrific value, but it still offers plenty of style. 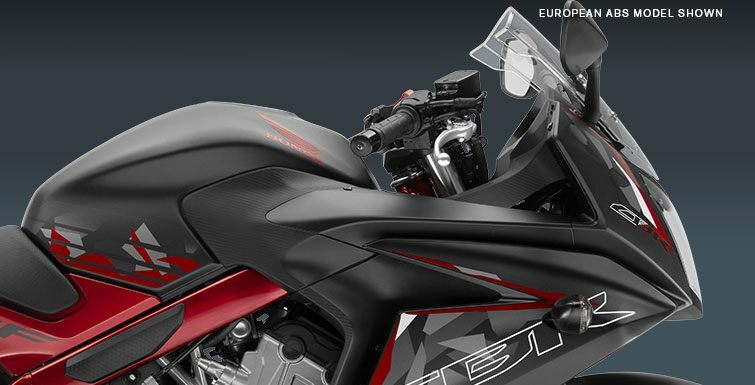 Check out its CBR600RR-inspired front cowl—just enough bodywork to cut the wind blast and give it a cool look. 41 MM FRONT SUSPENSION: Our 41 mm front suspension offers excellent suspension action and a comfortable ride along with precise steering and front-end feedback. DUAL-DISC BRAKES: Here’s an area where plenty of other bikes would scrimp, but not the CBR650F. 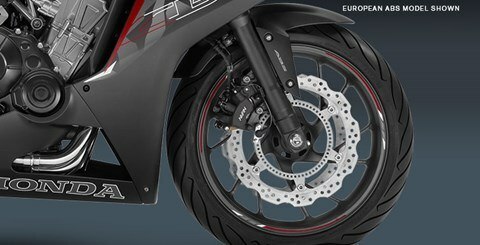 Dual 320 mm front discs offer excellent stopping power under a wide range of operations. One year, transferable, unlimited mileage limited warranty; extended coverage available with a Honda Protection Plan.